Chch - Champagne | ee - Red | Aa - AgoutiStraws Mighty Magnum is versatility! He has proven himself in the ApHC, NBHA and Open Show Rings - winning in events from in-hand to speed events. He holds a Bronze & Silver Medallion and 2 Superior Events along with his many other awards. Not only is "Magnum" loaded with athletic ability and versatility, but correct conformation and a quiet, easy-going personality that makes him a favorite to everyone that meets him. His willingness to work has also made him a favorite for trail riding and working on the ranch. Straws Mighty Magnum is the perfect combination of ability, brains and beauty. Straws Mighty Magnum is also proving himself as a sire. He is passing on his top of the line qualities - and show ring success - to his foals. They have his athletic ability, trainable personality and hearts of gold - not to mention they are beautiful! With limited showing they are stealing the spotlight - both in hand and under saddle. His foals are being shown and maintained by Youths, Non-Pros and Professionals. The proof is here - and we are just getting started! The past couple of years have been exciting! Straws Mighty Magnum comes by his talent and good looks honestly. He has lines tracing to Romans Straw Man, Skipper W, Wapiti and Mighty Bright you can't go wrong! 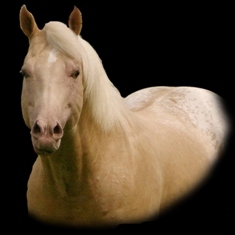 His sire, Straw Sham, is an own son of Romans Straw Man and has produced some top foals that have succeeded in both the United States and Canada. His get have earned well over 1000 ApHC points in Open, Non-Pro and Youth events, 11 ROMs and counting, Medallions, Club Champions & Superior Events! Now, Magnum's dam, Popeyes Pride is no slouch. While she never made it to the ApHC show ring, she has proven herself in the breeding shed. Her 3 foals have earned multiple Medallions, ROMs, over 300 ApHC points, and many Open Show wins! Please explore "Magnum's" home on the web and Contact Us with any questions.